A week long training workshop on a disaster impact mapping software tool that will allow Pacific Island countries to plan, prepare and respond to natural disasters effectively ended in Tonga last week. This tool is designed and developed for National Disaster Management Offices and related agencies. The training introduced the PacSAFE tool and its usefulness in supporting disaster management in Tonga. 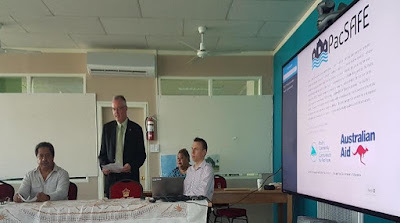 Participants across the Tongan government will be able to further understand and utilize this software for disaster impact mapping, with a special focus on tropical cyclone scenarios. Tonga has been identified as a highly hazard prone country and while addressing the workshop, H.E. Andrew Ford, Australian High Commissioner to Tonga said this tool will assist with better disaster risk reduction. “It helps to answer questions like “If Cyclone Ian were to pass over Tongatapu, how many houses would be impacted?” With different users, the questions can be tailored to address the unique challenges faced when responding to a disaster,” he said. “Thank you to SPC for supporting the project and leading the development of the PacSAFE application. Without the ongoing efforts of regional organizations such as SPC, it would be impossible to so readily strengthen the capacity of Pacific Island nations for disaster risk management,” he further added. The development of disaster management plans are important steps in strengthening disaster risk reduction programs. They can only be effective when risk assessments and contingency planning utilize realistic hazard scenarios and the workshop places special emphasis on tropical cyclone scenarios. Geoscience Australia has supported this tool and the development of training material which will build the capacity of disaster management offices and other stakeholders. PacSAFE is an open source project and is a free tool that can be copied and shared with anyone. The software package also has open access to relevant up-to-date and well maintained geospatial data which is a key driving force in the ability to use this tool. SPC’s Acting Director for Geoscience division, Akuila Tawake said that this tool will allow Disaster Managers to prepare for and respond to disasters and reduce the impacts of disasters on local population and infrastructure.